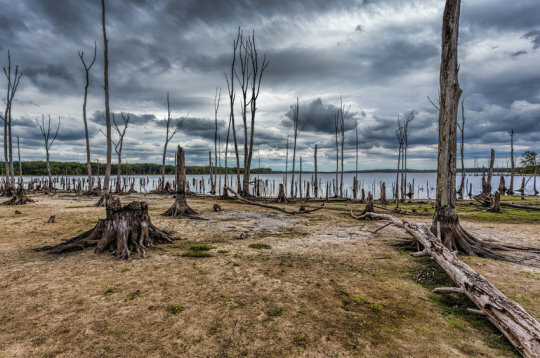 Without dramatic reductions in greenhouse-gas emissions, most of the planet's land-based ecosystems -- from its forests and grasslands to the deserts and tundra -- are at high risk of 'major transformation' due to climate change. With the "business as usual" emissions scenario expected changes would threaten global biodiversity and derail vital services that nature provides to humanity, such as water security, carbon storage and recreation. Without dramatic reductions in greenhouse-gas emissions, most of the planet's land-based ecosystems -- from its forests and grasslands to the deserts and tundra -- are at high risk of "major transformation" due to climate change, according to a new study from an international research team. The researchers used fossil records of global vegetation change that occurred during a period of post-glacial warming to project the magnitude of ecosystem transformations likely in the future under various greenhouse gas emissions scenarios. They found that under a "business as usual" emissions scenario, in which little is done to rein in heat-trapping greenhouse-gas emissions, vegetation changes across the planet's wild landscapes will likely be more far-reaching and disruptive than earlier studies suggested. The changes would threaten global biodiversity and derail vital services that nature provides to humanity, such as water security, carbon storage and recreation, according to study co-author Jonathan Overpeck, dean of the School for Environment and Sustainability at the University of Michigan. "If we allow climate change to go unchecked, the vegetation of this planet is going to look completely different than it does today, and that means a huge risk to the diversity of the planet," said Overpeck, who conceived the idea for the study with corresponding author Stephen T. Jackson of the U.S. Geological Survey. The findings are scheduled for publication in the Aug. 31 edition of the journal Science. Forty-two researchers from around the world contributed to the paper. The first author is geosciences graduate student Connor Nolan of the University of Arizona. Overpeck stressed that the team's results are not merely hypothetical. Some of the expected vegetational changes are already underway in places like the American West and Southwest, where forest dieback and massive wildfires are transforming landscapes. "We're talking about global landscape change that is ubiquitous and dramatic," Overpeck said. "And we're already starting to see it in the United States, as well as around the globe." Previous studies based largely on computer modeling and present-day observations also predicted sweeping vegetational changes in response to climate warming due to the ongoing buildup of carbon dioxide and other greenhouse gases. But the new study, which took five years to complete, is the first to use paleoecological data -- the records of past vegetation change present in ancient pollen grains and plant fossils from hundreds of sites worldwide -- to project the magnitude of future ecosystem changes on a global scale. The team focused on vegetation changes that occurred during Earth's last deglaciation, a period of warming that began 21,000 years ago and that was roughly comparable in magnitude (4 to 7 degrees Celsius, or 7 to 13 degrees Fahrenheit) to the warming expected in the next 100 to 150 years if greenhouse gas emissions are not reduced significantly. Because the amount of warming in the two periods is similar, a post-glacial to modern comparison provides "a conservative estimate of the extent of ecological transformation to which the planet will be committed under future climate scenarios," the authors wrote. The estimate is considered conservative in part because the rate of projected future global warming is at least an order of magnitude greater than that of the last deglaciation and is therefore potentially far more disruptive. "We're talking about the same amount of change in 10-to-20 thousand years that's going to be crammed into a century or two," said Jackson, director of the U.S. Geological Survey's Southwest Climate Adaptation Center. "Ecosystems are going to be scrambling to catch up." To determine the extent of the vegetation change following the last glacial peak, the researchers first compiled and evaluated pollen and plant-fossil records from 594 sites worldwide -- from every continent except Antarctica. All of the sites in their global database of ecological change had been reliably radiocarbon-dated to the period between 21,000 and 14,000 years before present. Then they used paleoclimatic data from a number of sources to infer the corresponding temperature increases responsible for the vegetation changes seen in the fossils. That, in turn, enabled them to calculate how various levels of future warming will likely affect the planet's terrestrial vegetation and ecosystems.